The Bio-Star Greenhouse is the second generation entry level greenhouse from Exaco Trading. 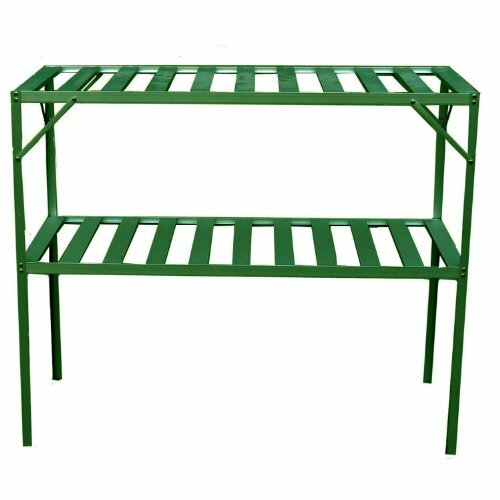 The free standing two level staging shelves give you extra space for plants, seedling trays or any other tools you need to keep handy. Shelves are 46-inch long, 20-inch deep and 38.5-inch high. Slats allow for good drainage. Free standing allows you to move the shelves where you need them. If you have any questions about this product by Exaco Trading Company, contact us by completing and submitting the form below. If you are looking for a specif part number, please include it with your message.